While the Pyongyang Restaurant [See Below] shut down the same year as it opened – allegedly due to a dispute between the Dutch owner Remco Van Daal and its North Korean staff – the Haedongwha staff will now be managed in cooperation with an ethnic Korean manager named John Kim. Kim, who has lived in the Netherlands for most of his life, also runs a business in Pyongyang exporting sand to Singapore, a source familiar with his background told NK News. Unlike Haedangwha restaurants in China, which are run directly by the North Korean government, the Netherlands branch is unique in having non-North Korean ownership but a North Korean staff. You can read more about the restaurant in Het Parool. Michael Madden tracked down the location. Here is the official web page of the restaurant. Learn more about the “other” Haedanghwa here. A North Korean restaurant in Amsterdam staffed by cooks and waitresses from the isolated country has closed its doors. Dutch newspaper De Telegraaf reported Thursday that Pyongyang Restaurant’s closure was permanent and stemmed from a disagreement between its Dutch owners and North Korean staff. The restaurant was an oddity, believed to be the only of its kind in Western Europe, though there are similar restaurants in Asia. Dutch labor authorities say North Koreans can get work visas for Europe under standard rules, but few do. A woman who answered the phone at the restaurant said the establishment was closed. She couldn’t say for how long because she was not authorized to do so. Its website says it is closed “due to holidays.” Phone calls to the owner Thursday went unanswered. 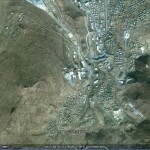 See more here at North Korea Leadership Watch. A North Korean restaurant has opened in the Dutch capital of Amsterdam in what could be the communist nation’s latest attempt to earn hard currency and foster closer ties with Europe. The “Pyongyang Restaurant” was launched late last month under a joint venture between North Korea and two Dutch businessmen. While North Korea is known to operate dozens of restaurants across Asia, it is the first time a North Korean restaurant has opened in Europe, with the exception of a canteen that briefly operated near the North Korean Embassy in Vienna in the mid-1990’s, according to a local source, who spoke on the condition of anonymity. The restaurant is staffed by nine North Koreans, including the director and manager, Han Myong-hee, who worked for 15 years at a North Korean restaurant in Beijing operated by the North’s ruling Workers’ Party. Pyongyang Restaurant, which seats 24 people, has its walls covered with pictures of Pyongyang and North Korean nature, while its menu consists solely of a nine-course meal priced at 79 euros (US$104). Han said there are plans to offer more affordable dishes such as Korean noodles and dumplings after the restaurant’s official opening on Feb. 17. “After our official launch, we plan to gradually serve a variety of dishes and during lunch hours as well,” she said. The restaurant currently serves only dinner. The opening ceremony is expected to be attended by the North Korean ambassador to Switzerland, other North Koreans, and key figures from the Netherlands and different European nations, Han said. Analysts said the restaurant is likely to serve not only as a source of much-needed cash but also as a bridge to Europe for the isolated North. UPDATE 1 (2014-1-21): See more recent data here and here. North Korea’s mineral exports to China have tripled this year compared to a year ago, a study showed Sunday. A joint study of Chinese data by Yonhap News Agency and Seoul-based IBK Economic Research Institute showed that China imported 8.42 million tons of minerals from North Korea from January to September this year, worth US$852 million. Over the first nine months of last year, China brought in 3.04 million tons of minerals from the North for $245 million. Most of the minerals were anthracite coals, the data showed. 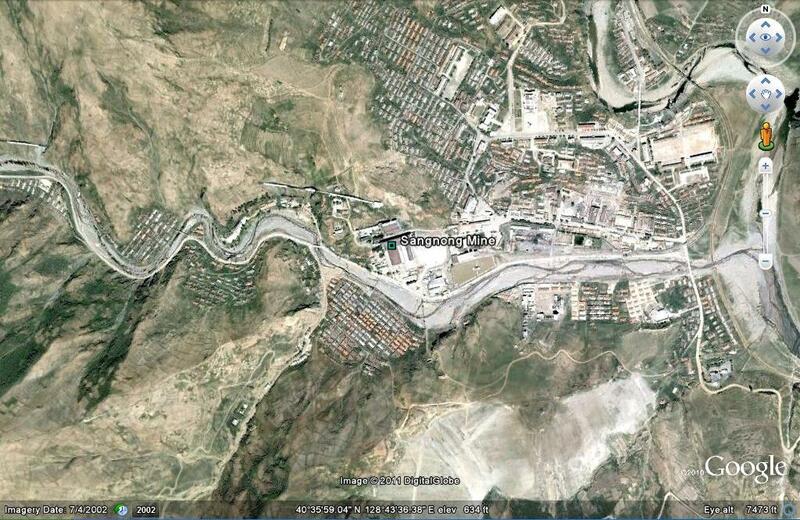 This year, of 8.42 million tons, 8.19 tons were anthracites. China is the sole major ally and the biggest economic benefactor for North Korea, a reclusive regime under international economic sanctions following its nuclear and long-range missile tests. Cho Bong-hyun, an analyst at the IBK institute, said North Korea may be trying to earn much-needed hard currency as it aims to become a powerful and prosperous country by 2012. China appears to be trying to stockpile mineral resources at affordable prices, Cho added. North Korean anthracites were traded at an average of $101 per ton, whereas the international standard for quality anthracites is $200 per ton. “Given that North Korean coals are of very good quality, trade with China must have been made at a fairly low price,” Cho said. Meanwhile, sources said North Korean authorities last month entirely halted its coal exports, as the impoverished country fears a shortage of energy resources during the upcoming winter. From January to September this year, China exported 732,000 tons of minerals to North Korea, most of them crude oil. Here is the IBK web page. If anyone can find a copy of this report and send it to me to post, I would appreciate it. 1. The economics lessons: A. The more isolated the DPRK’s economy from the global trade and financial system, the greater monopsony power Chinese firms can exert on their North Korean trading partners. B. 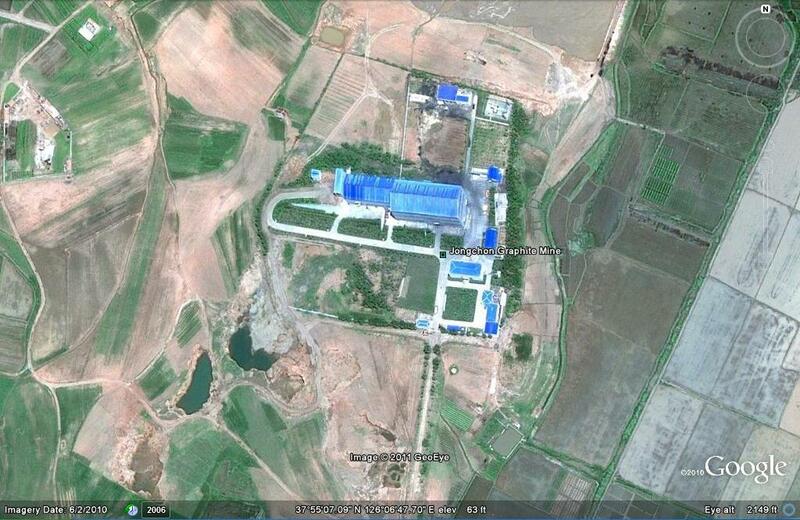 The rents earned in the current DPRK-China trade regime are visible and have organized constituencies. Unfortunately the much greater gains that could be reaped if the North Korean economy was more open, integrated, and dynamic remain unseen and their potential beneficiaries remain unknown and unorganized. 2. The Nautilus Institute published a very interesting paper by Nathaniel Aden on China DPRK trade back in June. See it here. 3. 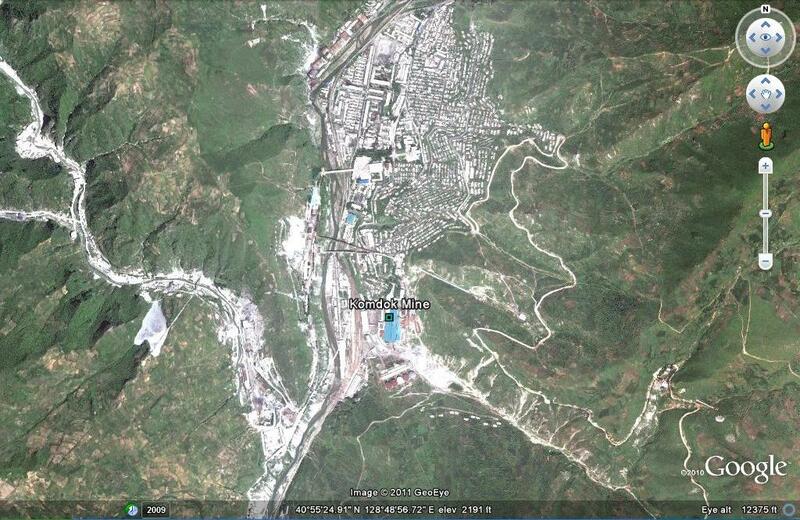 Here is the most recent US Geological Survey report on the DPRK’s mineral sector. 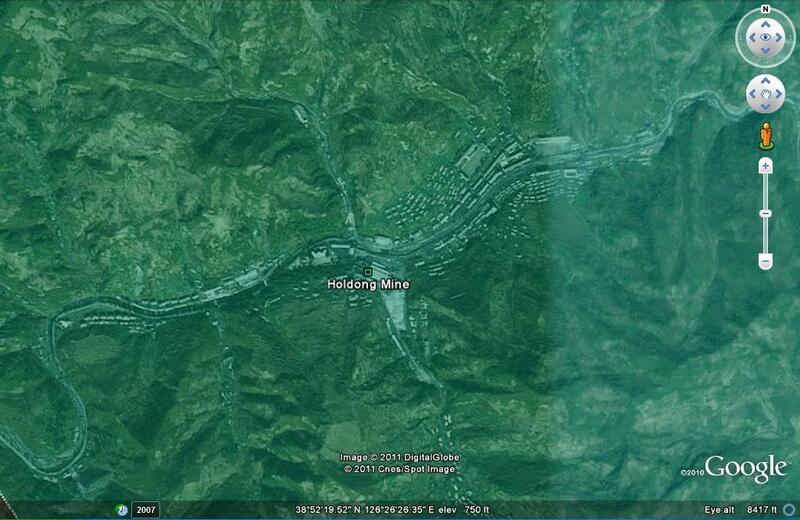 Sangnong Worker’s District, Hochon County, South Hamgyong Province. 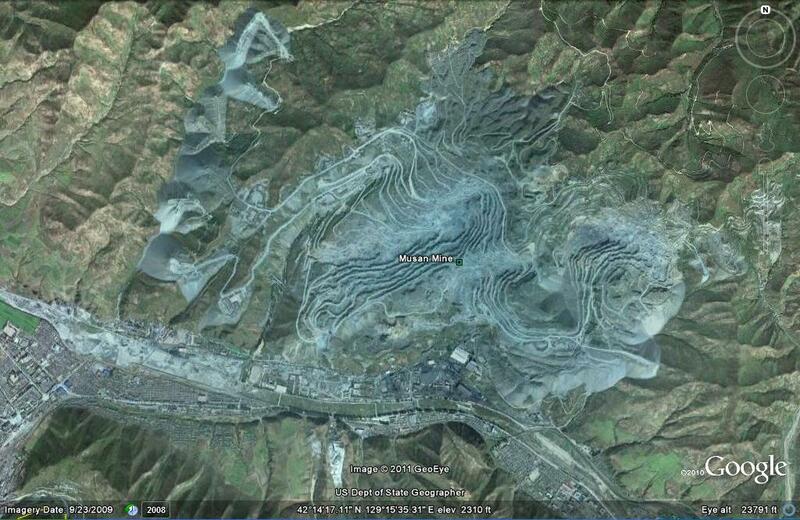 According to the paper, the mine is located in the “Dancheon district of Hamgyeongnam-do”. 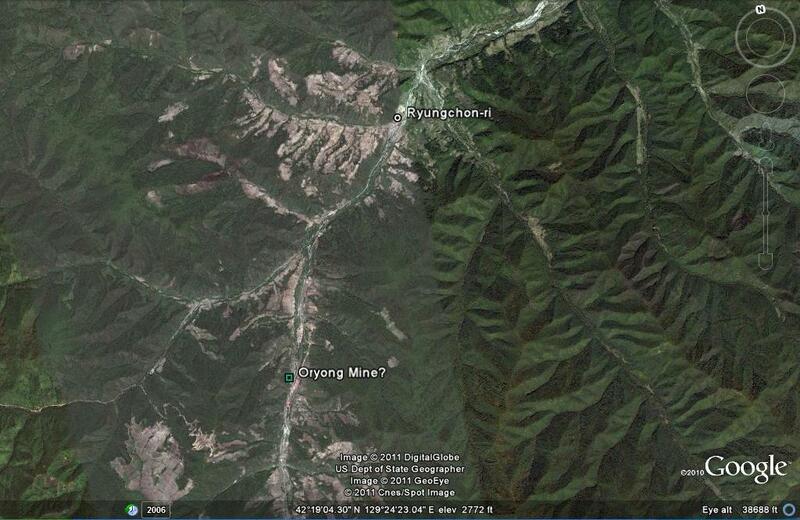 According to the paper, the Oryong Mine is near Ryungchon-ri (42°20’18.19″N, 129°24’39.48″E) in Hoeryong and opened in 2007. 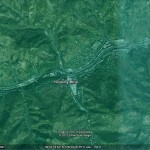 The satellite imagery of the area is from 2006 and shows an area under construction near the village. 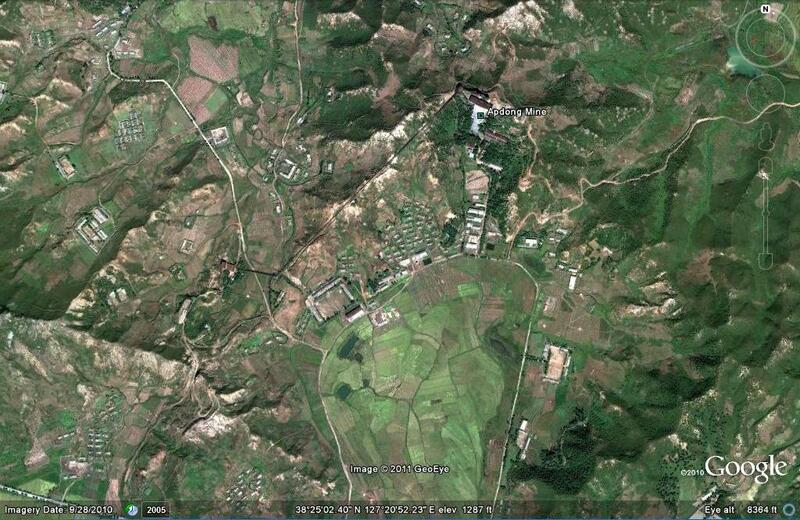 Another source claims this mine is located in Obong-dong, closer to the city of Hoeryong and is a uranium mine. 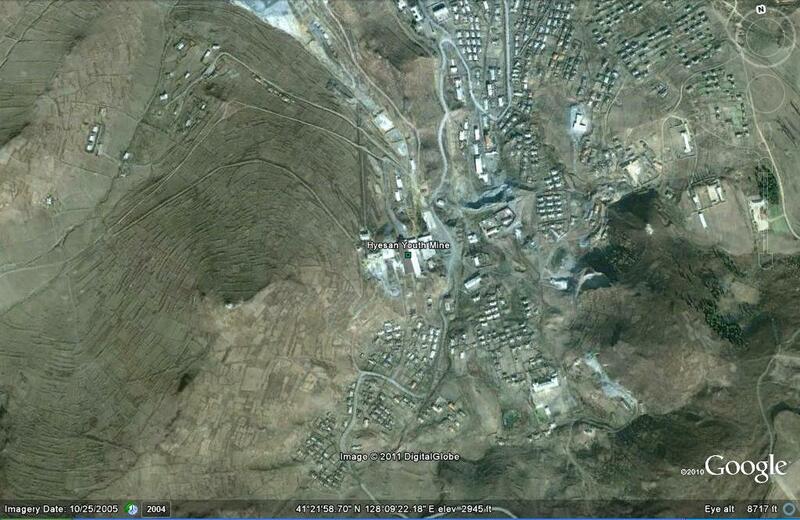 Jongchon-ri, Yonan County, South Hwanghae. 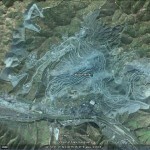 The paper claims the mine is located in “Jeongchon-gun”, which does not exist. Download the PDF here. This publication has been added to the list of previous CRS reports on the DPRK here. View the paper here. A link to this paper has been added to the DPRK Economic Statistics Page. The Nautilus Insitute has also posted links to some very interesting presentations from the 2010 DPRK Energy and Minerals Working Group. More information TBA, but see here and here (Korean). Order here at Amazon. More here and here. South Korean companies have suspended their sand imports from North Korea, one of the longest-running economic cooperation projects between the countries, as tension mounted over the March sinking of a South Korean warship, a Seoul official said Tuesday. Seven South Korean companies have stopped sending cargo vessels to North Korea since Monday, Unification Ministry spokesman Chun Hae-sung said. “We warned them to be careful about the safety of their employees” because political tension is rising between the Koreas, Chun told reporters. He denied that the government pressured the companies into suspending their imports, saying they “voluntarily” halted their operations after the warning. “There are fears that further deterioration in the inter-Korean ties may undermine their businesses,” he said. The suspension is the latest in a series of developments that indicate worsening ties between the Koreas after the warship sank near the border with the North, killing dozens of seamen. South Korea suspects the North was behind the tragedy and is set to announce the results of its weeks-long probe into the sinking later this week, vowing a stern response to those found responsible. Pyongyang denies any role in it. The cargo companies have brought more than 38 million tons of sand from North Korea since 2004, the ministry said in a statement. Most of the sand came from the western coastal city of Haeju. The trade, despite its small scale, was considered a symbol of reconciliation because it was seen as mitigating tension along the maritime border between the Koreas. Their navies have clashed three times near the Yellow Sea border since 1999, the latest in November of last year. Since last week, South Korea has also stopped funding government-level exchanges with North Korea and urged hundreds of companies to refrain from starting new ventures with Pyongyang. The countries remain technically at war after the 1950-53 Korean War ended in a truce rather than a peace treaty. South Korea is to phase out its main import from North Korea, delivering a heavy blow to an impoverished regime already reeling economically from confiscated arms shipments and bungled currency reforms. Sand was the biggest export to South Korea from the north in 2008, earning Pyongyang $73m (£47m). That represents about twice as much as it gains annually from wages at factories in Kaesong, a cross-border industrial zone for South Korean companies. South Korean officials told the Financial Times that Seoul would phase out sand exports when existing contracts with its northern neighbour expired. “Once those companies receive their sand, for which they have already paid, that will be the end,” a senior South Korean security official said. It could have a profound political impact – but South Korean officials insist the decision was taken because Seoul increasingly dredges its own sand domestically. Officials admit that South Korea has long worried that money paid for sand goes to the military, but they say increased dredging and the imminent conclusion of numerous outstanding contracts have given it the opportunity to end the trade. North Korea is trying to compensate for South Korea’s decision by seeking alternative sand markets in Russian construction projects. 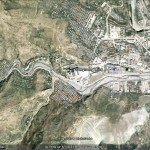 Russia’s Itar-Tass news agency reported late last year that North Korea would ship sand to Vladivostock for use in building projects for the Asia-Pacific Economic Co-operation summit in 2012. Sand shipments to South Korea started in 2002 amid inter-Korean rapprochement – but were suspended last March while North Korea prepared to fire a long-range missile over Japan. Pressed by construction companies that have been affected by the import ban, Seoul resumed imports from North Korea in November. The current flow, however, is less than one-fifth of previous levels. In an effort to salvage the trade with South Korea, Pyongyang has offered to provide sand to South Korean companies in exchange for other building materials and fuel. But the South Korean unification ministry said domestic companies were not interested and had not applied for export licences to conduct such swaps. 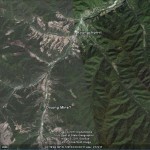 Previous posts on North Korean sand can be found here. North Korea’s cash-strapped government is offering to swap sand, resources licenses and rental income in return for concrete, steel and fuel, according to Munhwa Ilbo newspaper. The government sent letters to companies in China and South Korea asking them to invest $320 million in a construction project in the capital, Pyongyang, the Korean-language paper reported. In addition to the investment, the government is seeking 30,000 tons of diesel and gasoline, 50,000 tons of steel bars and 300,000 tons of cement, the paper said, citing one of the letters. In return, the letters offer investors long-term rental income, the rights to resource development and sand. North Korea’s finances are being squeezed by United Nations sanctions imposed because of the country’s nuclear weapons program. The letters were sent to the companies via an investment group, the paper said. 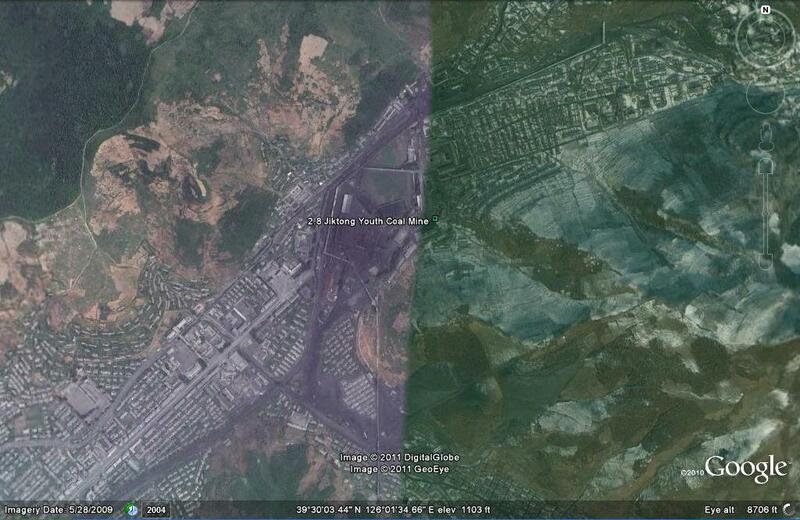 The government wants to build 100,000 homes in Pyongyang, it said. Pyongyang shouts at Seoul, but demand for money is louder. It is the politically motivated shameless provocation to resort to a futile military adventure to preserve the illegal “northern limit line” still today when the times have changed. Warships of the navy of the south Korean forces described the exercise of the right to self-defence by a patrol boat of the north side as “an act of trespassing on the above-said line” and preempted the firing of direct sighting shots and “shots aimed at destroying it”, not “warning shots” though they were well aware that the patrol boat and its crew sailed to confirm an unidentified object. This was an inexcusable deliberate and open military provocation. The rash action perpetrated by them, firing thousands of bullets and shells with several warships involved at a time was a premeditated action of the rightwing conservative forces and bellicose military group of the south side to stem the trend of the situation on the Korean Peninsula which has shown a sign of detente through the third skirmish in the West Sea. 1. The south side should make an apology to the nation for orchestrating the recent incident and putting it into practice and take a proper measure to promptly punish the prime movers of the incident as maniacs of confrontation with fellow countrymen and harassers of peace. 2. The south side should behave with discretion as required by the times and the desire of the nation, clearly mindful that its stand to preserve the “northern limit line” no longer works. 3. Reminding again that there exists in the West Sea of Korea only the extension of the Military Demarcation Line in the waters set by the KPA side, it will take merciless military measures to defend the extension from this moment. 4. The south side will be held fully accountable for having disturbed the reconciliation and unity of the nation and hamstrung the efforts to achieve peace and reunification and have to pay a dear price for them. A North Korean cargo ship entered South Korean waters Saturday — a sign that trade has been unaffected by a recent deadly naval clash off their western coasts, an official said. The ship dropped anchor west of Seoul just one a day after North Korea’s military threatened to “take merciless military measures to defend” itself and warned that South Korea would be forced to pay a heavy price for the recent firefight over their disputed maritime border. A Unification Ministry spokesman says, however, that neither side has taken any measures to restrict inter-Korean trade — one of few legitimate sources of foreign currency for the impoverished communist North. The naval skirmish was the first in seven years and came ahead of a trip to Seoul by President Barack Obama, who arrives Wednesday. 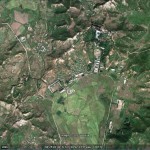 A senior South Korean military officer said one North Korean officer died in the fight and three others were wounded. South Korea suffered no casualties. South Korea responded by putting its 680,000-member military on guard, though officials said they have seen no evidence of unusual North Korean moves. The cargo ship, delivering silica to a South Korean company, passed through the disputed border Saturday and is scheduled to enter Incheon port on Monday, said a Port Authority official. He asked not to be identified because he was not authorized to speak to media. The decision to permit the North Korean ship entry was made before the clash, Unification Ministry spokesman Chun Hae-sung said. North Korean ships have docked 35 times at the port the in the first nine months of the year, according to the Port Authority. South Korea is the No. 2 trading partner of North Korea, with trade volume reaching $1.1 billion in the first nine months of this year, according to the Ministry, which handles inter-Korean affairs. “Silica” is silicon dioxide, and it is more commonly known as sand. 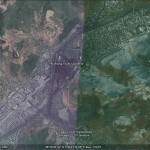 Read past posts about the DPRK – RoK trade in sand here. The ship unloaded 1,750 tons of silica at Incheon Port, west of Seoul, and sailed back to the North later Monday, according to port official Lee Jin-wu. The ship departed from a North Korean port last Thursday, two days after the neighboring countries clashed along their disputed western sea border. The government has tightened rules on imports of sand, pine mushrooms and anthracite from North Korea, the Unification Ministry said Tuesday, in an apparent move to keep a close eye on cash flows into Pyongyang. The three items have been allowed into South Korea only with a declaration to the customs office, but the toughened rules now require their importers to receive approval from the unification minister, said ministry spokeswoman Lee Jong-joo. “Inter-Korean trade volumes of pine mushrooms, sand and anthracite have rapidly increased recently,” Lee said in a press briefing, without specifying the hike rates. “This revision was prepared in consideration of two things — transparency of inter-Korean trade and keeping the import volume at a proper level,” she added. Seoul has so far required approval from the unification minister, only when excessive imports of a certain item are feared to harm local producers. Those three items are not considered to fall into that category. 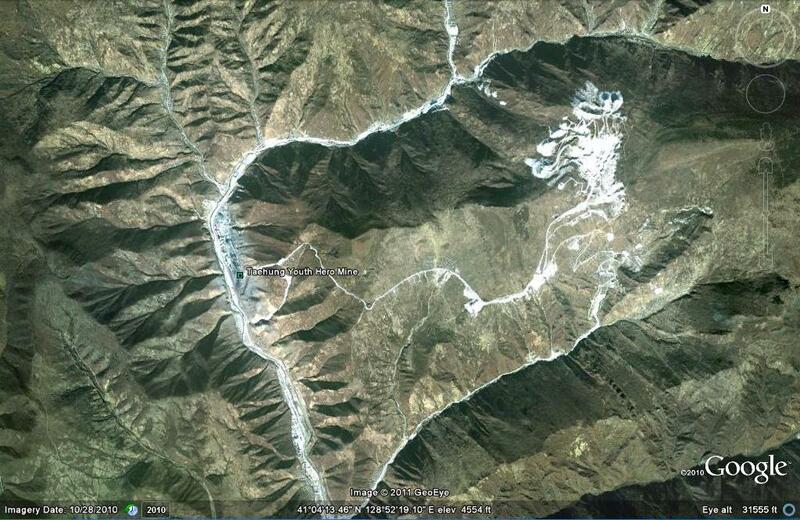 North Korean sand has been rumored to be linked to the country’s military. The concerns prompted Seoul to ban local sand importers from traveling to North Korea after it launched a long-range rocket in April, and such trips are not still allowed. Last year, US$73.35 million worth of sand, $14,93 million of pine mushrooms and $25.1 million of anthracite were imported from North Korea. Sand was the largest imported item, while anthracite was 9th and pine mushrooms 18th. With the tightened entry rules, the government can “make a judgment on the site about whether each business is appropriate and get sufficient information about them, thereby enhancing the transparency of inter-Korean trade and its soundness,” the spokeswoman said. South Korea has suspended sand imports from North Korea since April, when the North test-fired a long-range rocket. 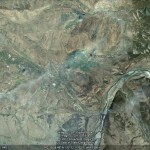 Seoul had banned sand importers from traveling to the North. 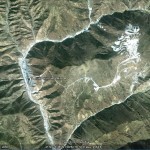 South Korea first brought in North Korean sand for use at local construction sites in late 2002, as part of an inter-Korean accord signed by leaders of the two Koreas in 2000. “The government is reviewing the resumption of imports of the North’s sand, given strong requests from businesses and the overall state of current inter-Korean relations,” an informed government official said, requesting to be unnamed. The South Korean government is expected to decide soon whether to lift the travel ban on sand importers as well, according to officials. Seoul reportedly placed the travel restriction on sand importers due to suspicions that payments for sand shipments were pocketed by military authorities in the North. Read other stories about the sand trade here. Summary: For the next 4 to 5 years, the North Korean mining sector is likely to continue to be dominated by the production of coal, iron ore, limestone, magnesite, and zinc. 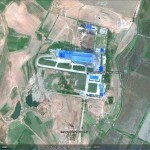 Because of growing demand for minerals by China and the Republic of Korea, their investment in North Korea’s mining sector is expected to increase and to extend beyond their current investments in apatite, coal, copper, and iron ore into other minerals, such as gold, magnesite, molybdenum, nickel, and zinc. North Korea’s real GDP is expected to grow at between 1% and 2% during the next 2 years. North Korea ranked third in production of magnesiate in the world. Its value-added product–magnesia clinker, which is used as a refractory metal–was marketed world wide. According to Corporate social Responsibility Asia (CSR Asia), North Kroea ranked virtually last in environmental sustainability in the world, despite the country’s enactment of major laws for environmental protection, such as the Land Law of 1977, the Environmental Protection Law of 1986, the Forrestry Law in 1982, and the Law on Protection of Useful Animals in 1998. 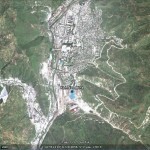 On the basis of North Korea’s industrial structure in 2004 (the last year in which data is available), the mining sector accounted for about 8.7% of North Korea’s gross domestic product. 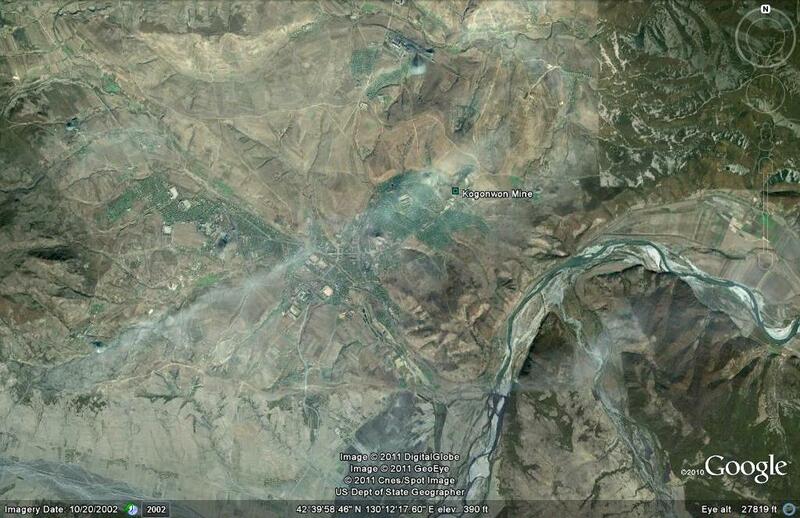 Recoverable coal reserves in North Korea were estimated to total about 8 billion metric tons in 2006. Coal production reportedly dropped to about 23 Mt/yr in 2006 from 37.5 Mt/yr in 1985 mainly because of outdated mining equipment and technology. You are currently browsing the archives for the Sand category.